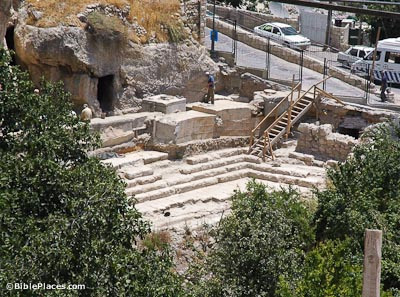 This is part two of my series on the top ten discoveries in biblical archaeology. Simply put, there have been too many discoveries over the past 150 years of archaeological investigation that confirm the historical reliability of Scripture to settle on just the top ten of all-time. So, I decided to write two blog posts: a list of top ten discoveries relating to the Old Testament and this list of top ten discoveries relating to the New Testament. One final note before we begin: I’m focusing on discoveries and inscriptions that are largely accepted by the academic world, and have avoided ones that are highly debatable (such as the James Ossuary and the Shroud of Turin). With this in mind, here are the top ten discoveries in biblical archaeology relating to the New Testament. In Acts 13, we read of how Saul and Barnabas set off on a missionary journey to the Island of Cyprus. Upon arriving at Paphos, they meet the proconsul, Sergius Paulus, leading him to faith in Christ. Luke describes him as “a man of intelligence” (Acts 13:7). This is true as Sergius Paulus was also a first-century author and is one of the authorities referenced by Pliny the Elder in his classic, Naturalis Historia. There have been numerous Sergius Paulus inscriptions discovered throughout the Roman empire, as the family seems to have been large and influential. 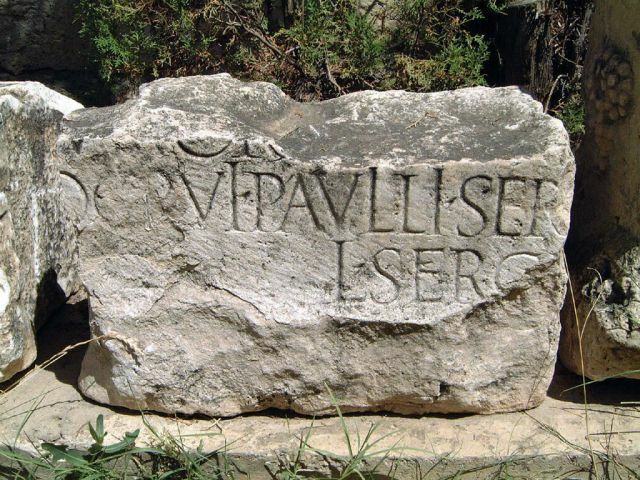 In 1877, an inscription was discovered at Soli, not far from Paphos that dates to AD 54 and references, “the proconsul Paulus.” Another inscription from Rome, dating to a few years later names Lucius Sergius Paulus as one of the curators of the Tiber River under the Emperor Claudius. Finally, numerous inscriptions, most famous of which names a “L. Sergius Paulus” have been discovered near Pisidian Antioch. The Soli inscription confirms Sergius Paulus as proconsul of Cyprus at the time the Bible says he was. 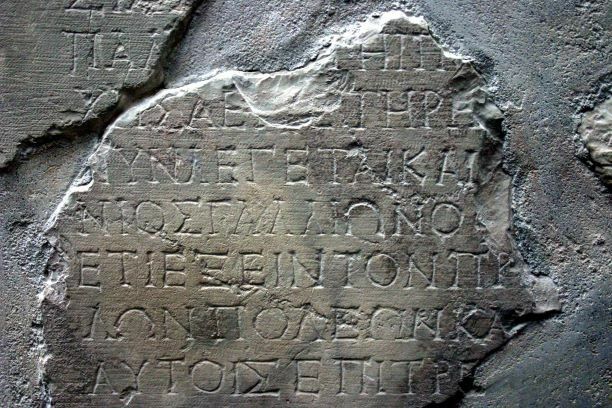 The inscriptions from Pisidian Antioch confirm that the Paulus family estate was located nearby. In Acts 13, Saul’s name is changed to Paul immediately after leading Sergius Paulus to the Lord. Furthermore, immediately after leaving Cyprus, Paul and Barnabas make their way to Pisidian Antioch. Scholars have suggested that these are clues that Saul as adopted into the Paulus family through the Roman practice of adrogation and that he made his way to Pisidian Antioch to become acquainted with the rest of the family. Finally, the inscription from Rome indicates that Sergius Paulus was demoted from the honored position of Proconsul to a relatively minor civic role of watching over the city’s riverbanks. His conversion to Christianity is a plausible explanation for such a demotion. Regardless of how one interprets the data, the numerous Sergius Paulus inscriptions confirm the historicity and basic details of Sergius Paulus as recorded in the Bible. In John 9, Jesus heals a blind many by making a mud poultice and applying it to his eyes, and then telling him to go and wash in the Pool of Siloam. Visitors to Jerusalem have long visited a 5th-century Byzantine “Pool of Siloam” that had been built by Empress Eudocia to commemorate this miracle. The Byzantine pool is at the end of Hezekiah’s Tunnel, the aqueduct that brings water from the Gihon Spring into the city. The exact location of the Pool of Siloam of Jesus’ day remained a mystery until its discovery in 2004. In the summer of that year, repairs were being made to a drainage system when two ancient steps were uncovered. Archaeologists were called in and when the excavations were complete, a large pool was uncovered. In all at least 20 steps leading down from the street level into the pool were revealed. Pottery from one end of the pool was used to date it to the First-Century AD, while at the southern end, a large wall and section of the pool dating to the Old Testament period was discovered. Given that it was in the exact location that scholars had long believed the actual Pool of Siloam to be – only 70 meters from the Byzantine pool – and that it dated to the time of Jesus, it was identified as the actual Pool of Siloam where the blind man had washed to receive healing. When the Apostle Paul wrote his letter to the Romans from Corinth, he sent greetings from “Erastus, the city treasure.” The Greek word for “treasurer” is oikonomos, which means “manager” or “steward.” It is a general term that could be applied to both a high-ranking city official or even a slave who held the role of “steward” in a household. It is likely a term that the Apostle Paul uses to describe Erastus’ job, rather than his official title. In 1929, archaeologists excavating at Corinth discovered an inscription on a large paving stone near the theater. It dates to the middle of the first century A.D. and reads, “Erastus, in return for his aedileship laid [this pavement] at his own expense.” The seven-inch high letters in the inscription would have been filled with bronze at one time, although they are hollow today. An aedile was an elected official who maintained public buildings, kept the streets in good order, oversaw the market, and managed the local games (such as the Isthmian Games held every two years in Corinth). While aedile and an oikonomos are not exactly equivalent terms, the term oikonomos could describe the work that an aedile would do. Thus, the Erastus that the Apostle Paul mentioned was likely the high-ranking Corinthian official who laid the paving stone at his own expense. Any time an artifact and the earthly remains of an individual named in Scripture are discovered it’s an important discovery. In 1990, a construction team was building a water park near Jerusalem when their bulldozer plowed through a the roof of a first-century tomb. 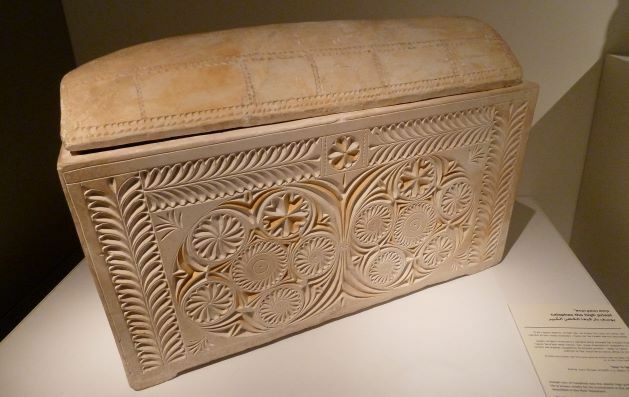 Archaeologists were called in and discovered a variety of ossuaries (bone boxes used in the first-century), including an ornate one that was inscribed with the name “Joseph son of Caiaphas.” Inside were the bones six people, including those of a 60-year old man which scholars believe are the remains of Caiaphas himself. Caiaphas was the high priest who presided over the trial of Jesus according to the gospels (Mt 26:3, 57; Lk 3:2; Jn 11:49). The ancient historian, Josephus, records that Caiaphas’s full name was Joseph Caiaphas and that he held this role from AD 18-36 (Jewish Antiquities, 18:35 & 18:95). It appears that he was widely known by his surname/family name, Caiaphas, in the same way that many of the sons of Herod were simply known as Herod (ie. Herod Antipas, Herod Archelaus, etc). Many scholars are convinced that this is the ossuary of the high priest who played a prominent role in the trial of Jesus. His ossuary and physical remains provide archaeological evidence confirming the existence of a prominent person in the New Testament. The Caiaphas ossuary is currently on display in the Israel Museum in Jerusalem. Given the amount of time Jesus and the early church spent in the Temple in Jerusalem any discoveries relating to this Jewish holy site are of utmost importance. The Second Temple (also known as Herod’s Temple) was destroyed by the Romans in AD 70. Its destruction was so complete, and the subsequent building on the Temple Mount site so extensive, that very little evidence remains in situ of the Temple that stood in Jerusalem during the first century. This, combined with limit to excavations around the Temple Mount itself, means that artifacts directly relating to the Second Temple are scant. Scant, but not non-existent! Two specific inscriptions have been discovered that were once in place in the Temple complex during the first century. In the temple complex was the court of the Gentiles – a courtyard that was the closest area that gentiles and ritually impure people could get to the Temple itself. Between this court and the inner courts of the temple precinct was a wall – described in detail by Josephus – on which were warning signs in both Greek and Latin that forbade foreigners from going beyond that point on pain of death. In 1935 a second fragmentary temple warning inscription was discovered outside of the Old City of Jerusalem near the Lion’s Gate. In 1968, archaeologist Benjamin Mazar discovered a 3-foot long stone block among the rubble that had been thrown down from the Temple Courts above during the destruction of the Temple in AD 70. On it was the incomplete inscription reading, “To the place of trumpeting.” The block had obviously formed part of the parapet above where the priests would have sounded the trumpets (as described by Josephus). These two inscriptions are the clearest archaeological evidence we have testifying to the Second Temple and the closest we can get to the most hallowed place of Jewish worship in the first century. 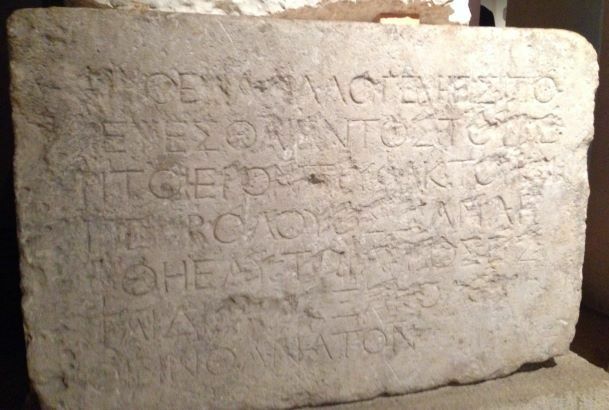 In 1878, Wilhelm Froeher acquired a marble slab bearing a Greek inscription from Nazareth. 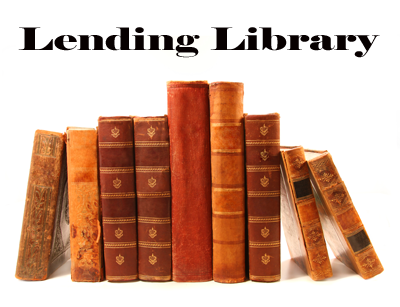 When he died, his collection was acquired by the Paris National Library, where it was “rediscovered.” In 1930 it was translated and published by French scholar M. Franz Cumont, causing considerable excitement in the academic community. The “Nazareth Inscription” as it has become to be known, is an “edict of Caesar,” likely dating to the reign of Claudius (41-54 AD). It imposes a death penalty in Israel for anyone caught moving bodies from family tombs, and specifically “sepulcher-sealing tombs,” such as the one Jesus was buried in. A study of the wording of the inscriptions has lead scholars to conclude that it is directed specifically at the Jewish community. The inscription states that Claudius had been “acclaimed Imperator for the 26th time,” dating it to between January and August, AD 52. In his book on biblical chronology, Dr. Andrew Steinmann notes that since Proconsuls usually took office on May 1st and served for only one year, we know that Gallio served as Proconsul of Achaia from May 1, AD 51 to end of April AD 52. Knowing this allows us to pinpoint when the Apostle Paul was in Corinth; he would have been brought before Gallio by the Jews sometime in the middle of AD 51. The Gallio Inscription is a fixed marker by which we can date most of Paul’s ministry and much of the history of the early church. One of the most infamous historical figures in the New Testament is Pontius Pilate – the man who sentenced Jesus to death. His historicity has never really been in doubt, as he’s mentioned by ancient writers, such as Josephus, Tacitus and Philo, in addition to the gospel accounts. Interestingly, the “Pilate Stone,” as it has come to be known, confirmed that Pilate’s title was prefect, and not procurator, as Tacitus mistakenly calls him. Prefects and procurators, while having similar roles, were not the same. Procurators were appointed as civic officials who governed politically and generally had civil or financial backgrounds. Prefects were usually military men selected to keep the peace in a particular province of the Roman empire. The gospel writers simply use the general term hegemanos, which means “to lead,” when describing Pontius Pilate. The office of prefect was abolished sometime in the early 40’s during the reign of Claudius, which explains why Tacitus, writing in the early second century AD would use the term procurator, which he was familiar with. The Pilate stone confirms that Pilate was indeed the Prefect of Judea. More recently, a second artifact with Pilate’s name on it came to light. In 2018, A copper ring that had been unearthed during the 1968-69 excavations at the Herodium was cleaned, photographed and analyzed revealing the Greek inscription, “of Pilatus.” Rings like this were common among Roman soldiers, and since the name Pilate is uncommon, many believe the ring was once the property of Pontius Pilate or one of his servants. 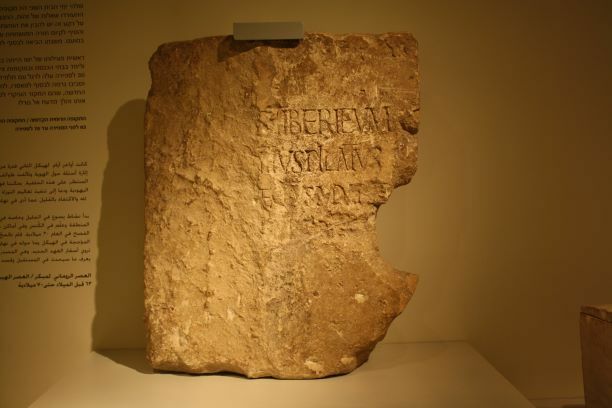 The Pilate Stone (and perhaps the Pilate Ring) provide archaeological evidence supporting the historicity of the Roman Prefect, Pontius Pilate, who handed Jesus over to be crucified. 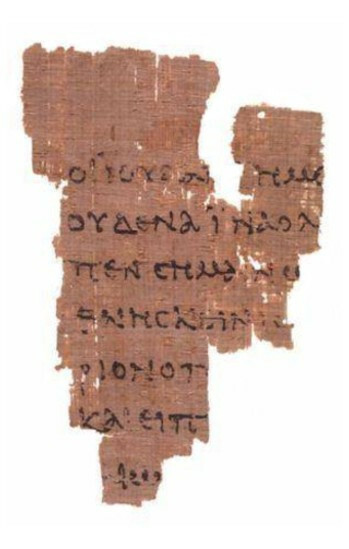 The earliest New Testament manuscript is a fragment of the Gospel of John, known as the Rylands Library Papyrus P52(more commonly shortened to simply P52). It measures 8.9cm by 6cm and contains parts of John 18:31-33 on one side and parts of verses 37-38 on the reverse written in Greek. The papyrus manuscript has been dated from AD 125-175. Given that the Apostle John likely wrote the gospel that bears his name sometime in the late first century AD, this means we have a copy that dates to less than 100 years after it was written. P52 itself was part of a collection of papyri that Bernard Grenfell purchased in Egypt in 1920. It wasn’t until 1934 that another scholar translated the text on the fragment and realized that it was from the gospel of John. When it was finally translated and published the full significance of the manuscript wast realized. 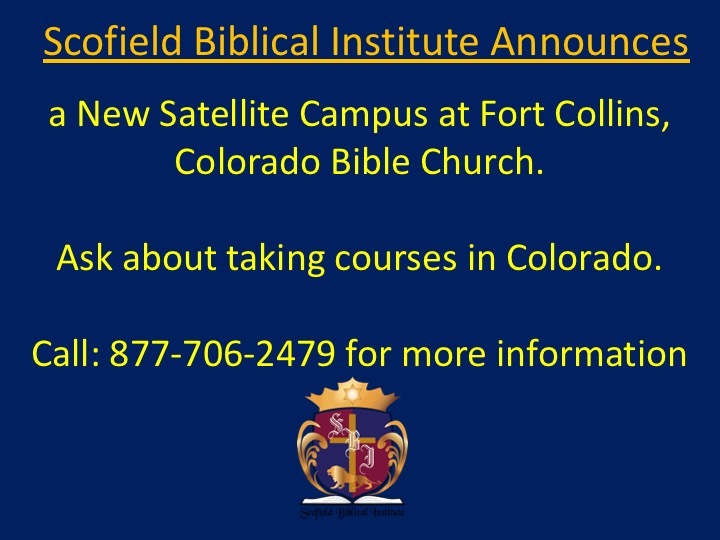 Since the manuscript was discovered in Egypt, a significant distance away from Ephesus, where the gospel was originally written, we can see that the text of the Bible was being copied and circulated far afield already in the early second century AD. The Rylands Library Papyrus P52 is one of over 5800 biblical Greek manuscripts – fragmented or complete – discovered so far (in addition to the 10 000 Latin manuscripts and 9300 manuscripts in other ancient languages). It is the earliest link in the chain that connects the Bibles we read today to the original manuscripts. 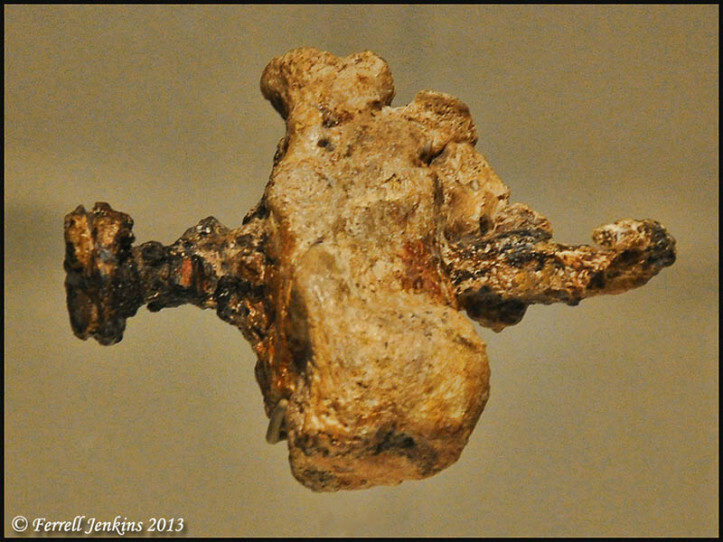 Archaeologically, the most important piece of evidence for Roman crucifixion is the heel bone of the crucified man. While many authors wrote about crucifixions (Josephus, Plautus, Senneca), with the discovery of a heel bone of a crucified victim – nail still embedded in it – scholars were able to analyze the Roman form of execution first-hand. In 1968, a construction crew with the Israeli Ministry of Housing was working at an area in northeast Jerusalem when they accidentally dug up several tombs. Archaeologists who were called discovered numerous ossuaries, including one that contained the bones of an adult male who had been crucified. His name, Jehohanan (Yehohanan), was inscribed on the outside of the bone box, and his right heel bone still contained the rusted spike from his crucifixion. It seems the nail must have hit a knot in the wood of the cross and bent. It probably couldn’t be removed from the victim by his family without doing considerable damage to his foot, and so it was left in place. An analysis of the heel bone and the nail dated them to the first century AD, and revealed that Jehohanan had likely been crucified with a leg on either side of the cross and the nail driven in sideways through his heel. The bones of Jehohanen also bore evidence that his legs may have been broken. This discovery confirms the description of crucifixion in the Bible, including the nailing of feet and the breaking of legs. Furthermore, it provides a definitive response to critics who argued that Jesus could not have been buried in the tomb of Joseph of Arimathea because a crucified criminal would not have been dignified with a proper burial in Rome. Rather, critics argued, his body would have been disposed in a mass grave for the condemned. We now see that the loved ones of a crucified victim could retrieve the body and prepare it for burial it in a family tomb. Every year material culture from the people, places, and events described in the biblical text are unearthed. 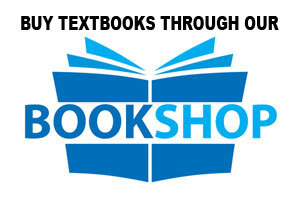 Every year new learning is gained from these discoveries. When we step back and view the cumulative effect of 150+ years of biblical archaeology I believe it is an overwhelming testimony to the historicity of the Bible.